Hydro's non-welded technology for over 30 years. Utilizing GS-Hydo's non-welded connection from 1/4" to 24" in Pressure ranges from 150 to 10,000 PSI we guarantee a piping system that fabricates faster, installs quicker and cost less. GS-Hydro advantage, please call or visit our website at www.qs-hydro-us.com. To great fanfare, Inigo Tapias, the new 138,000 cu. m. liquefied natural gas (LNG) carrier was launched on Jan- uary 29 by IZAR's Sestao yard in Bilbao. The ship — standing in testament to the 1.213 workers at Sestao who physically made the ship a reality as well as the under- lying strength of the IZAR company — is a highly sig- nificant one for many reasons, both technical and busi- ness. The 933-ft. (284.4-m), 19.5 knot ship embodies the hopes of a shipbuilding nation that is seeking to re- establish its presence in the LNG niche that it has not occupied for more than three decades, as the production of gas ships generally lays in the hands of Far East builders today. The ship is unique in many respects - not the least in that it was launched into the water, sliding down its building way in the traditional manner in the presence of thousands of guests, both local residents and VIPs from the shipping world. It is the first of the series of five (two to be built at Sestao, two to be built at Puerto Real, and the fifth still undecided) that takes advantage of the millions invested in updating the shipbuilding technolo- gy and capacity at Sestao. In the last two years, the ship- yard in Sestao has received: new flow of fabrication; new curve-blocks lines; new light-blocks lines; new sub- assembly curve blocks lines; additional lifting capacity; and new warehouse building construction. IZAR. according to company officials, wants to differentiate itself with technology, as it is the only way to be and stay ahead." "Decade of Gas"
To say that competition for a slice of the gas trans- portation market has heated up is a vast understatement. Astilleros Espanoles and Bazan into the current compa- ny, identified the coming future as "the decade of gas." The IZAR LNG ship is unique in many respects, but its signature is its longer, more slender hull, as compared to other vessels of this type and capacity. With a length of 933 ft. (284.3 m) and a breadth of 139 ft. (42.3 m), the vessel is designed to be more speed efficient compared to vessels from other makers, giving it a slightly higher speed with the need for less propulsion power. This, of course, translates to dollars saved. IZAR. upon determining that the gas market would be central to its future shipbuilding plan, licensed the right to build all three major types of LNG gas transport sys- tems; aluminum spheres, prismatic tanks, and mem- brane. 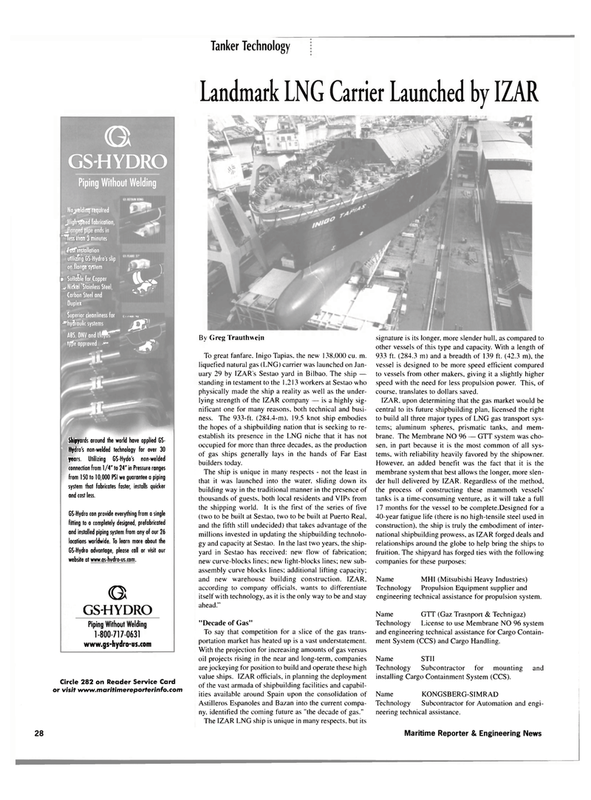 The Membrane NO 96 — GTT system was cho- sen, in part because it is the most common of all sys- tems, with reliability heavily favored by the shipowner. Technology Propulsion Equipment supplier and engineering technical assistance for propulsion system. Technology License to use Membrane NO 96 system and engineering technical assistance for Cargo Contain- ment System (CCS) and Cargo Handling.